The Competition commission of India has rejected Ajay Devgn Film's(ADF) complaint against Yashraj Films alleging unfair business practice. 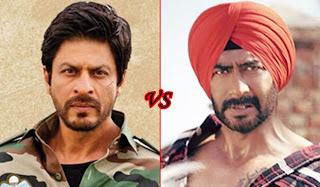 ADF had alleged that cinema owners forced to sign up to screen Jab Tak Hai Jaan along with Ek Tha Tiger by Yashraj films leaving not many screens for their film Son of Sardar which is also slated for Diwali release. Yashraj Films refused to comment on the ruling. 1). There Are Total 9000-10,000 Screen Space Is Available India,From Which Bollywood(Hindi) Movies Can Be Released In 5,000-6,000 Screens. 2) YRF Booked Only 2600 Screens For "Jab Tak Hai Jaan" So There Are Minimum 2000 Screen Space Available For "Son Of Sardar".So There Is No Issue For Lodging Complain Against YRF. 3)YRF Booked Their Screens On "First Come First Book" Basis.As YRF Decided To Release "Jab Tak Hai Jaan" 4 Months Before & Talked To Various multiplexes and single screen owners . Where As ADF Decided To Release Their Movie Few Day Before. Noting that it cannot issue restraint orders with respect to agreements which are of minor importance, the Commission said that while issuing such orders, it has to "keep in mind the overall exhibition market and not a particular period of the market". Ajay Devgn Films` complaint was against six parties -- Yash Raj Films, Yash Raj PP Associates, Yash Raj Puri & Co, Yash Raj Pal Film Distributors (Bangalore), Yash Raj Vandana Film Distributors and Yash Raj Kushgara Arts. However ADF Can Go To High Court For This Issue.